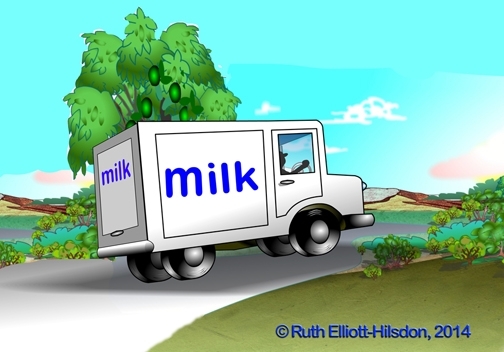 When I hear the words, ‘MILK TRUCK’, three uncanny stories come to mind. Absolutely true. Two are from my own life. Take the next ‘step beyond’ to see what happened. One day at the ripe age of 7 years old, I got out of school an hour earlier than my brother and sister, and walked home to an empty house. I went to my neighbor’s, hoping to play with them, but they weren’t home, either. Thank goodness their swingset welcomed me, remembering how they had always told me I could use it, “…any time”. Having just seen the movie, Trapeze, with Burt Lancaster, I figured this was my big chance to practice what I had seen him do. Sitting on the trapeze bar I’d get a good swing going, then hang by my knees and then slip down with my ankles wrapped around the chain so I could hang swinging by my feet. I was getting pretty good at it, when I got tired. Normally I would just drop to the ground onto my hands and knees. However, this day I was wearing sandals, not my usual sneakers, and as I tried to get off the trapeze bar, the strap of my right shoe caught the bottom loop of the chain, and I was stuck – hanging upside down by one foot! Terrified, the sudden realization hit me: I was alone. Who could help me? Without my siblings or neighbors, I yelled and cryed out to God or anyone who would listen, hoping someone would find me. Within minutes, someone did. A Milkman driving by saw me! I couldn’t believe it! My brother Mike and the Milkman had each unknowingly ‘heard’ my prayer. The second time a milkman came to the rescue was years later when I moved with my pregant sister into in a 4th floor walk-up apartment in New York City. We had no electricity and no telephone. One night, she suddenly started miscarrying and hemorrhaging profusely. “Oh, God!” I thought. “What should I do?” The neighbors across the hall were gone, and I had no way of getting her to the hospital. In a panic, I flew down the four flights of stairs to the street, waving frantically to cars going by, but no one would stop. In desperation, I went out into the street and yelled to the next vehicle I saw, a Milk truck! I told the driver in tears that my sister was bleeding to death and needed a ride to the hospital, a couple of miles up the street. He got right out and rushed to help her into to his truck, and took her to the hospital in time – and she lived! I never knew his name, or saw him again to thank him in person, but I can’t count the many times I thanked him in my heart. I know God answered my prayer through him that night. In the early 1800’s, an orphanage ran out of food. They had nothing to feed the 300 children under George Müller’s care*. It was time for breakfast, and the children were hungry, so he told everyone to sit down, fold their hands and pray, thanking God for what He would provide. Soon there was a knock at the door. It was a Baker, who said that God had woken him up at 3 in the morning telling him to quickly bake bread for the orphanage. Could they use it? Shortly after that came another knock at the door. A Milkman’s cart had broken down right in front of the orphanage – and without refrigeration the milk would spoil before he could fix the wheel. Would they please take the milk? That morning, a Milk man and a Baker had unknowingly been the vehicles to answer the prayers of those children. Each with different gifts he was given. One Bread, one Milk. But both with the ‘Milk of Human Kindness’. Whatever your image of a Creator, God or Heavenly Father, no one can deny that, the ‘Milk of Divine Kindness’ is active in our lives, listening and answering when we cry out. You never know when you may be called upon to deliver some of that ‘Milk’, too! EDU DESIGNS creates media for the heart and mind of children. Since we are an all volunteer non profit, we don’t get paid for what we do. But the rewards! The rewards are “Out of This World!”. Any funds donated are used to create and distribute materials to improve children’s character and education through the Arts. I’d like to share something with you today. The download of my Artbook for kids, called, “SEE WHAT YOU’RE LOOKING AT!” normally sells for $9.99, but I’d like to give a copy to anyone making a donation of any size. After you donate through the button below you’ll get your free download! Signup now and receive a free download of Ruth's Illustrated Behavior Charts! EDU Designs is a non profit organization whose mission is to produce and distribute multimedia materials for the education, motivation and character development of children. This entry was posted in Art, behavior, Character Development, Child Development, Children, Education, Ethics and Character, family, parenting and tagged answers to prayer, divine providence, doing the will of god, generosity, milk of human kindness, milk truck, milkman, miscarriage, orphans, selfishness, uncanny. Bookmark the permalink.